BERLIN (AP) — Germany coach Joachim Loew called up midfielder Emre Can for the upcoming UEFA Nations League games in the Netherlands and France after Kai Havertz and Antonio Ruediger dropped out on Monday. 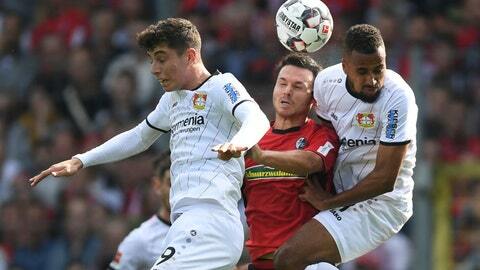 Havertz has a bruised knee and needs to sit out training for the next few days, while Ruediger has groin problems, the German soccer federation said. Forward Marco Reus is also out as a precaution despite an MRI scan showing his knee was injury free. Reus played in all 10 of Borussia Dortmund’s games this season, nine for the full game. Manchester City midfielder Ilkay Gundogan and Freiburg forward Nils Petersen were already out with injuries. Germany plays the Netherlands in Amsterdam on Tuesday and World Cup champion France in Paris three days later. The Germans drew 0-0 with France in their Nations League opener in Munich four weeks ago.